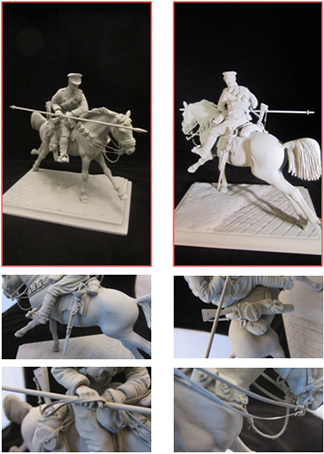 Victory Miniatures wanted something to commemorate the First World War Centenary and it was decided a mounted Lancer from the beginning of the War would do just that. This is probably our best kit to date; the sculptor, Paul Phillips, has managed to capture a most dynamic pose and the detail in the model has to be seen to be believed. The kit comprises 28 resin parts including a base and comes with detailed instructions and thumbnail pictures to aid assembly. A truly impressive kit that will grace any collection. My thanks to Paul Phillips for his sculpting skills and to Mike Wilkinson for his help in research and fantastic extra detailing on the model.